Phoenix, Arizona-Democrats are standing with Arizona parents, teachers, and students as we prepare for the oncoming attacks against our kids' schools. The slow march to drain our kids' public schools of resources is picking up in a very real way. But we are ready and we have a plan to turn things around. This is something we have seen time and time again in Arizona. We will continue to oppose efforts from the Republicans to swipe money from our kids' classrooms for private schools through ever-expanding voucher programs. There are several voucher bills being fast-tracked– despite reports that more than $100,000 of these funds were misspent in a six month period. Supporting our kids' schools is nonnegotiable. House Democrats are working with teachers to demand accountability from the Republicans. Republicans expect the public to believe they are trying to fix the crisis in our classrooms – conveniently leaving out that they created the crisis after years of prioritizing tax cuts for the rich over the needs of our kids. 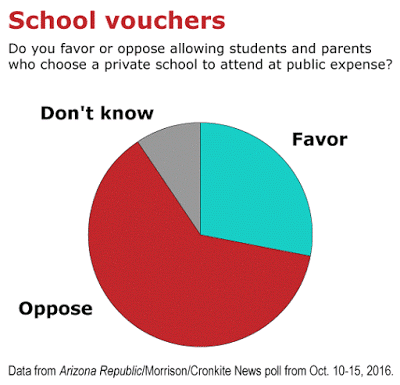 We've seen what those priorities produce and we agree with the majority of Arizonans who say our schools deserve more. House Democrats want to put our kids, our teachers and our classrooms before tax cuts for the rich. We support the reforms being proposed by Arizona Schools Now, which include focusing on recruiting and retaining teachers by increasing their pay in a meaningful way.